President Donald Trump, otherwise known as the 2016 Popular Vote Loser, the candidate endorsed by the Ku Klux Klan, Individual One (in the Southern District of New York), and Tiny (according to Stormy Daniels) does have chutzpah. Over the last month, he has falsely claimed, sometimes in front of predominantly Jewish American audiences, that the Democratic Party is Anti-Israel or Anti-Semitic. 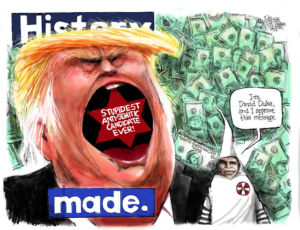 He has also had the temerity to speak out, again sometimes in front of primarily Jewish American Audiences, against letting in legal immigrants and asylum seekers, saying the United States is “full.” In his demagogic rants, he has particularly singled out Minnesota Representative Ilhan Omar for her poorly worded comments regarding Israel and the tragic events of 9/11. His beneath the dignity of the office of the Presidency attacks on her have sparked a petition drive to kick him off Twitter. The reason the KKK-endorsed candidate has chutzpah is that he is probably the vilest Anti Semite of them all and he has the gall to present his case to primarily Jewish American Audiences, some of whom had relatives die in Nazi concentration camps because this country in the 1930s said the United States was full and halted attempts, including blockading the cruise liner SS St. Louis from landing in Florida, for Jewish emigres fleeing Nazi persecution to enter. Was it Representative Omar that issued a proclamation on Holocaust Remembrance Day in 2017 that did not mention Jews? It was Donald Trump. Was it Representative Omar that broadcast a closing campaign ad singling out Jewish financiers and their part in the global economy? It was Donald Trump. Was it Representative Omar who twice told primarily Jewish audiences that she supported “their country” Israel and “their Prime Minister” Benjamin Netanyahu, implying they had dual loyalty? It was Donald Trump. Was it Representative Omar who said there were “fine people on both sides” after the racist charged events in Charlottesville where white supremacists chanted “blood and soil” and other Anti-Semitic rants? It was Donald Trump. Was it Representative Omar who said White Nationalism was not a rising threat after the horrific attacks against Muslims in New Zealand? It was Donald Trump. Was it Representative Omar that has used Mexicans and Muslims (like the Nazis used Jews and Gypsies) as scapegoats to carry on his anti-immigration policies? It was Donald Trump. Was it Representative Omar who separated immigrant children from parents (like the Nazi’s did) and put them in Concen….Detention Camps? It was Donald Trump. Was it Representative Omar who, like the Nazis, called for the use of Emergency Powers to fund different priorities contrary to the will of Congress? It was Donald Trump. Was it Representative Omar that put out a tweet during the midterms accusing Jewish financiers George Soros, Michael Bloomberg, and Tom Steyer of “buying the election?” It was not Donald Trump this time but then-Majority (now Minority Leader) Kevin McCarthy. 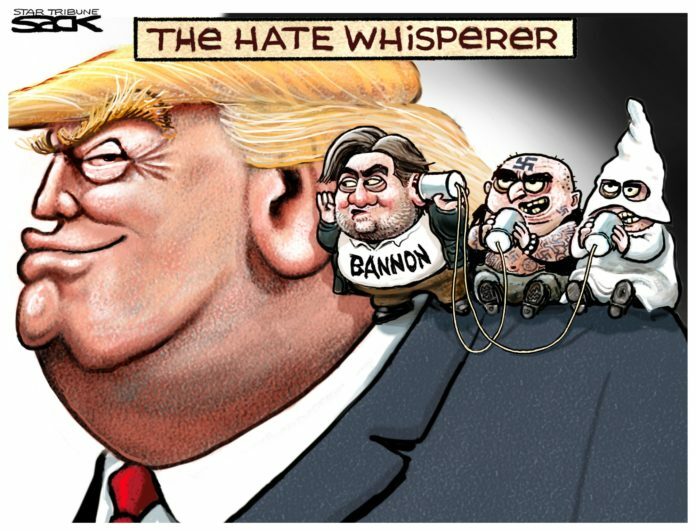 All Americans need to remember history and see how what Trump is doing to minority groups and Immigrants today is nothing more than Nazi’s, American First members, conservative reactionaries in Congress, and even a hesitant Franklin Roosevelt did (and did not do) to Jews in the 1930s. Do not repeat history and let this charlatan get away with this con job any longer and hold him to account for the reactionary policies he is pursuing that are only damaging the country.